His response was 'chocolate'!! Soooo boring! There was no way I was just going to make a plain chocolate cake, so I urged him to think of some other flavours or chocolate bars he likes and eventually he came up with 'mint'! Perfect! Chocolate & mint is one of my all time favour flavour combos for baking...it's right up there with lime & coconut and raspberry & white chocolate for me! The last comment my father in law added was 'don't make it too rich'! When my husband relayed this comment to me, I stared at him in horror! The only cakes I know how to make are rich ones! So thinking that I know best I ignored that last little comment, and went about planning a chocolate and mint cake. As far as birthday cakes are concerned if I can't fit overload in the title of the cake, it's not worth baking! so I thought of every mint chocolate possible and in the end decided a kit kat and m&m cake would go down well since the last one I made was so well loved! So I stocked up on mint kit kat's, but then remembered we were in Scotland and not in Vancouver and so mint m&m's were nowhere to be found! Aero balls seemed to be a good alternative! and added a nice splash of colour to the cake! I also picked up some slabs of Mint Aero to melt into the frosting to give it a hint of mint, and I blitzed some of the chocolate into the mint frosting I sandwiched the cakes with...so really you can't get more mint in a cake if you try! I used my trusty Primrose Bakery chocolate layer cake recipe because it never lets me down, and is always moist and fudgy. The silky chocolate frosting is always the perfect companion and the addition of mint was a subtle but tasty one. 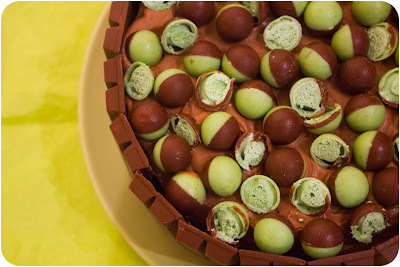 The mint frosting in the middle of the cake was perfect for breaking up the chocolate-y ness and the aero balls on top not only added great texture but also great flavour! and who doesn't love having 2 kit kat fingers with their cake to dip into the frosting! The book says it makes two 8-inch cakes, but I managed to make three 8-inch cakes with this recipe! I only used 2 and saved the 3rd cake for a rainy day! Break the choc into pieces and melt in 30 second intervals in a glass bowl in the microwave. Set bowl aside to cool. Cream the butter and sugar in a large mixing bowl for 3-5 minutes until the mix is pale and smooth. Put the egg yolks in a separate bowl and beat them for several minutes, slowly add the egg yolks to the creamed butter and sugar and beat well. Add the cooled chocolate to this mixture and beat well again. Combine the flour, baking powder, bicarbonate of soda and salt in a separate bowl. Combine the milk and vanilla extract in a jug. Add one third of the flour to the creamed mixture and beat well. Pour in one third of the milk and beat again. Repeat these steps until all the flour and milk have been added. In a clean bowl whisk the egg whites until soft peaks start to form. Carefully fold the egg whites into the main batter using a metal spoon (Do not beat or you will take the air out of the mixture). Divide the mixture evenly between the tins and bake for about 30 minutes. Insert a skewer in the centre of one of the cakes, it should come out clean if cooked. Leave to cool. Beat the butter and sugar together in a freestanding electric mixer with the paddle attachment. Add the peppermint extract and double cream and continue beating for 3-5 minutes until light and fluffy. Using a toothpick dab 3-4 spots of green food gel colour through the frosting. Beat for a further 2 minutes until the green colour has blended into the frosting and is consistent throughout (you can add more or less green colouring to suit your tastes, I went for a pale green colour). Crush Mint Aero into tiny bite size pieces, I used a blender to crush mine or you could use a zip-loc bag and a rolling pin. Stir it through the frosting with a wooden spoon. Melt the chocolate in 30 second intervals in a glass bowl in the microwave until smooth. Leave to cool slightly. In a large mixing bowl beat the butter, icing sugar, vanilla and double cream until smooth - this can take several minutes with an electric hand mixer. Add the melted chocolate and beat again until thick and creamy. If it looks too runny to use simply keep beating to thicken. Place one of the 8" chocolate cakes on a plate. 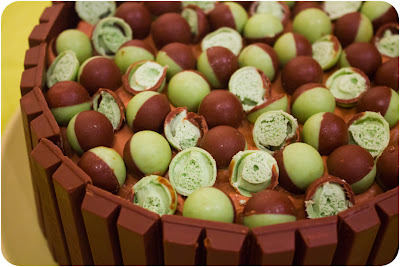 Spread the mint choc chip frosting on top of the cake using a palette knife until the top is completely covered. Sandwich the frosting by placing the other 8" chocolate cake on top. Completely cover the outside of the cake in the chocolate mint frosting. Using a pastry brush, brush the back of each two-finger kit kat with a small amount of chocolate frosting and stick it to the side of the cake. Chop some of the aero balls in half, and leave the rest whole and sprinkle over the top of the cake. Here is the birthday boy trying to enjoy the cake before I had even taken the picture! 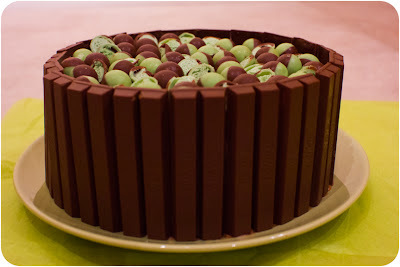 Lovely looking cake - the kit kat fingers give it such a neat finish! 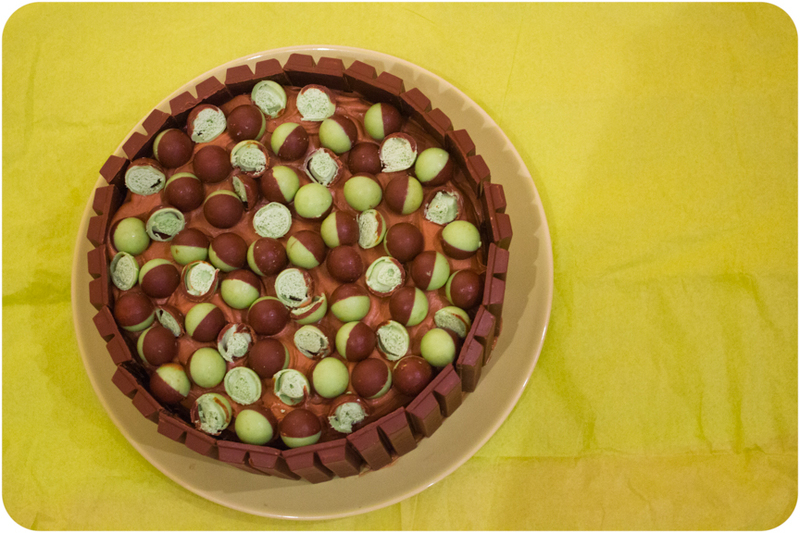 Now thats a what I call a minty choc cake, love that you have combined the mint aero balls into the buttercream. Love choc and mint combos and this cake looks gorgeous!! I love the primrose bakery recipe too - never fails. I'll have to bookmark this and make it one day. 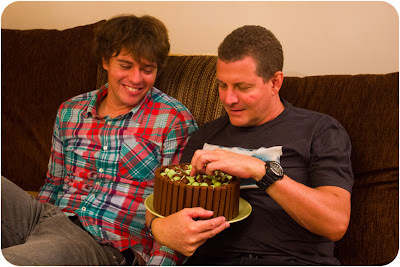 The Smarties & Kit Kat Double Chocolate Birthday Cake! Get That Friday Feeling....with Cadbury's Crunchie Cupcakes! © 2009-2015 Cupcake Crazy Gem. All rights reserved.